If you have a conference room or spend most of your time or designing one, well, this pendant light is perfect for you. It is also applicable in both office, commercial and home lighting applications. 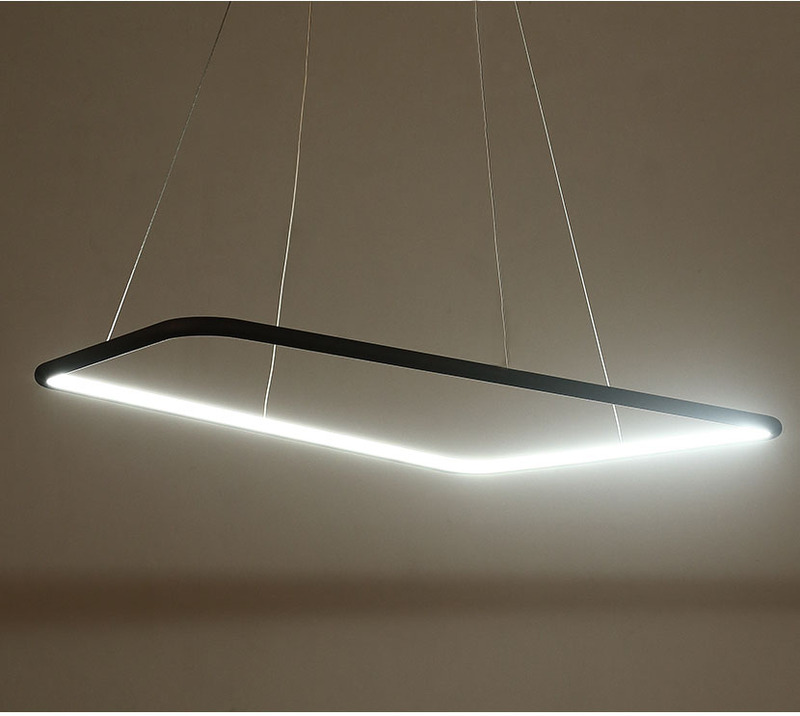 The idea behind this ModernPlace light, is it has been designed to light up large spaces and turn heads. It is also the perfect light fixture for a table or kitchen island. It will make your friends or colleagues to ask a lot of questions because its very bright and classy at the same time. This lighting fixture has the perfect size with 48 inches height (from canopy to maximum suspended length), 30.24 inches length and 15.15 inches which means that it will perfectly sit on any ceiling and make the room shine bright. It has been designed with a very modern and contemporary style in mind. The design has the capability to lighten even the dullest meeting. It also comes in a standard high grade aluminum metal and silicon with a powder coated black finish. It has one light inclusive of PCB LED bulb inside. The maximum compatible wattage is 40 watts and the voltage is 110 volts. It comes with fixtures like shatter resistant, instant on, shock and vibrant resistant. The PCB LED lighting is bright & efficient enough to light a hallway, workspace, office and kitchen. Compared to other lighting fixtures, this pendant lighting has the longest average life. With an average life of 60,000 hours you don’t have to worry about changing the bulb more times than you’d want to because this lighting will save you the hassle. The color temperature is either cool, that is 4500 kelvin or warm which is 3000 kelvin the choice is yours. You know the atmosphere you need more than anyone meaning that you have to select a light fixture with the color temperature that will make you comfortable. This pendant lighting comes with a Done LED driver and a three limited warranty. If you prefer a longer warranty like five years, there in add-on feature on their official website that allows you to select the five year warranty at an additional amount. The quadrate modern pendant light is definitely worth your money and the shape and design will make your heart warm inside. The aluminum metal body and the black finish adds a really nice touch to the pendant lighting. On their website there is a LED color option box which allows you to choose either warm white or cool white.